As we saw last week with Mythlogic's Callisto 1512, ultrabooks in the 15.6" form factor are strange beasts. It's pretty clear the industry as a whole is moving towards thinner, lighter notebooks at every traditional size; Intel's ULV processors aren't as fast as the standard voltage parts, but they're close enough that it can be difficult to justify the added bulk of a thicker machine. Couple this industry transition to slightly slower but much more power frugal parts with the increased emphasis on touch interfaces that Windows 8 brought and you end up with the most upheaval in notebook design we've seen in a long time. 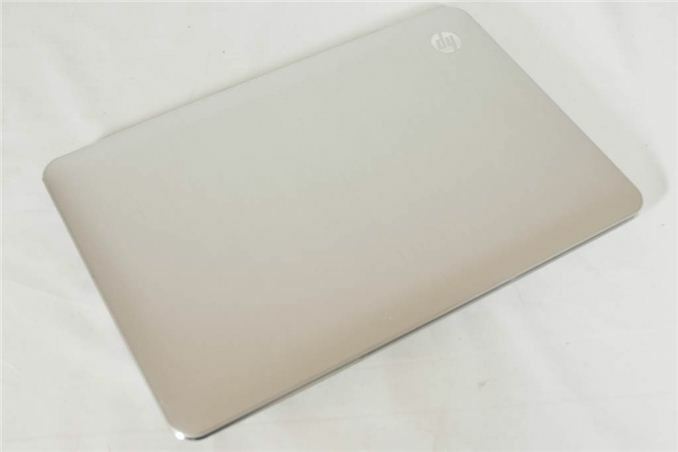 With that upheaval we also get unique designs like the one we have on hand today, the HP Spectre XT TouchSmart. 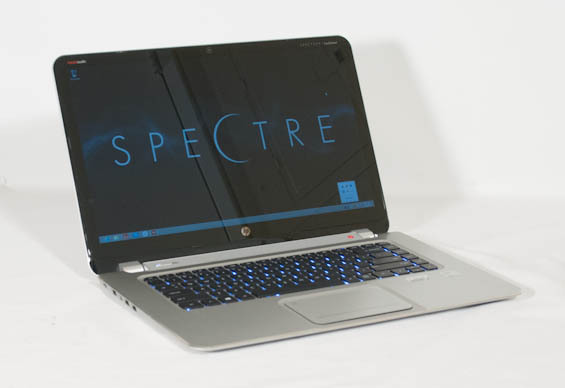 Spectre is essentially HP's premiere notebook brand until you get into their enterprise-class hardware, and so the Spectre XT TouchSmart is destined to be the absolute cream of the crop. The aluminum finish, glass touchpad, and 1080p IPS display are evidence enough of that. Yet while HP may have buffed the value proposition in a lot of places, the Spectre XT TouchSmart is unfortunately not without potentially severe compromises. Dimensions 14.87" x 10.01" x 0.87"
Chances are if you've been paying attention, two things popped out at you from the spec sheet: the Thunderbolt port, and the SSD caching. One of these additions is a fantastic value add; the other almost seems like a sad joke. Understanding that there are a lot of premium features on the Spectre XT TouchSmart, and that Thunderbolt isn't inexpensive to add, being stuck with an SSD cache backing up a dismally slow 5,400-RPM mechanical hard drive in a $1,299 notebook is inexcusable. It's frustrating because the rest of the design is firing on all cylinders. The Intel Core i7 CPU is more than fast enough for the majority of tasks, HP includes the requisite 8GB of DDR3-1600 to guarantee a comfortable Windows experience, and 5GHz wireless networking is accounted for. Connectivity is healthy with USB 3.0 support alongside Thunderbolt, there are four speakers with BeatsAudio branding, and the display is even a quality 1080p IPS panel. So why hamstring the build with Intel Smart Response Technology instead of just installing a 128GB SSD minimum? Was the cost savings really worth it? Stupid comment. This products "fails" to be suitable for you, but not everyone is like you. There are very few matte touch screens. Have you ever seen a matte touch screen at say, a POS kiosk or an ATM? Touching it quickly wears down the finish so you have glossy spots on the screen. See http://www.anandtech.com/show/6585/lenovo-thinkcen... for an example of a rare matte touchscreen that doesn't have this problem. "Come on HP. I thought you were smarter than that." An HDD is only acceptable in a computer if you don't care about or have control over all the software running in the background. If I'm going to recommend this device to anyone, and they're not going to take the time to cut away the useless bundled crapware, then its not an acceptable experience.